Well, we have arrived in the first week of Spring… and the last week of beautiful Starfruits. 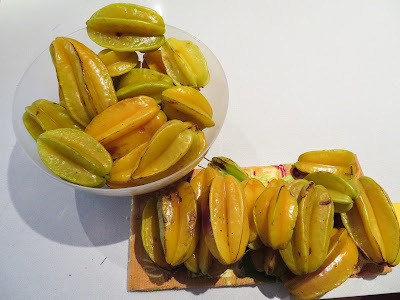 This week, we have harvested our last basin of Starfruits, and what a season it has been! In Sydney, the Starfruit tree begins to produce its purple-and-white flowers in late Spring, continuing through Summer and Autumn. The first fruits can be plucked in March and April, with the main harvest period being through the cool of winter – July and August. Now, five and a half years from planting, our seedling tree has yielded more than 100 fruit in its third fruiting year. 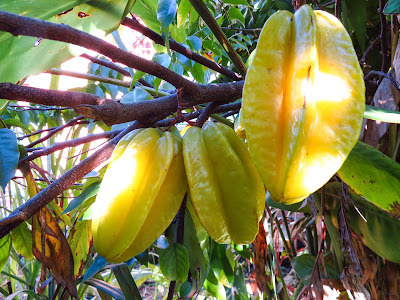 Starfruit trees are easy to manage. Planted in a warm aspect, with regular fertilising and watering, the tree will prosper in southern locations. 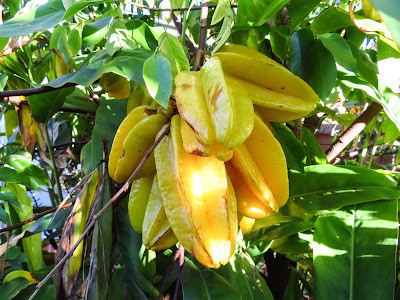 It is also our experience that the Starfruit does not attract fruit fly attack. One of the challenges of having 100 fruits at one’s disposal has been finding ways to use them. Eaten fresh regularly, made into one of the tastiest fruit juices almost every night, and turned into a most delicious jam, the Starfruit tree is a splendid addition to a small garden. And of course, the fruits have been lovely gifts for appreciative friends. With the fruit now gathered, it is time to trim the tree. In our case, before flowering begins, simply clipping for height to facilitate harvest will be sufficient… And don’t forget the feed and water!